Skinner's Field & Trial Turkey & Rice is a specially formulated daily maintenance diet for dogs with sensitive stomachs and digestions. Containing a wholesome balance of ingredients for the internal nourishment and protection of your dog, including whole rice, turkey meat meal, sunflower oil and mineral supplements for the support of joints. A delicious and nutritious diet for dogs prone to stomach upsets resulting from ingredients such as wheat, soya and dairy, which are not included in this recipe. With advanced levels of omega 3 and 6 fatty acids to enhance the condition of your dog's skin and coat and strengthen and support it's natural defenses. Whole rice (40%), turkey meat meal (21%), naked oats, peas, linseed, sunflower oil, beet pulp, vitamins, minerals and trace elements. Joint Aid supplement (2% comprising of glucosamine, chondroitin, collagen, MSM, glutamine, curcumin, oils & fats, beta glucans, oligosaccharides). Iron (as ferrous sulphate monohydrate) 40mg, Iodine (as calcium iodate anhydrous) 1.5mg, Copper (as cupric sulphate pentahydrate) 5mg, Manganese (as manganous oxide) 25mg, Zinc (as zinc oxide) 100mg (as zinc chelate of amino acids hydrate) 30mg, Selenium (as sodium selenite) 0.1mg. Contains tocopherol rich extracts of natural origin (Vitamin E) as EC permitted antioxidant. 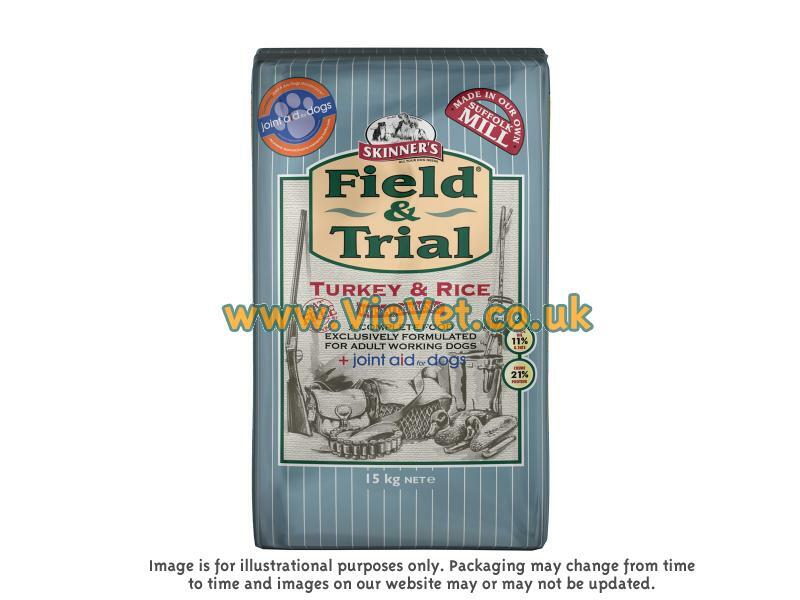 There are currently no questions for Skinner's Field & Trial Turkey & Rice Dog Food - be the first to ask one!